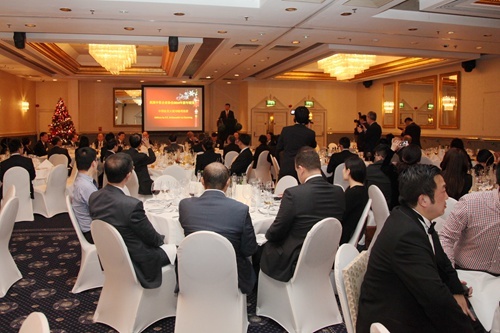 It is a true pleasure for me to attend the New Year’s Dinner hosted by China Enterprises Association in Britain (CEAB). This event gives me an opportunity to join business leaders from both China and UK in celebration of the New Year. As we look back at 2013, I am pleased to see this has been a year when China-UK relations were back on track and started a new journey. 2013 has also been a year full of highlights for our trade and business relations. China-UK bilateral trade scaled to a new high. Chinese statistics show that from January to November this year, China-UK trade increased by over 10% on a year-on-year basis. This is much higher than the average 1.5% growth of China-EU trade. This UK performance outshines all other EU country members. Such scale and scope of Chinese investments in Britain were never seen before. Now nuclear energy and high-speed railways will be two key areas for our investment cooperation. Our two countries are working together to pull off projects in these areas and make them new flagships of our economic cooperation. · The Pudong Development Bank and Guangfa Securities arrived in Britain. · Major Chinese banks are seeking license for opening branches in Britain. · Huawei and China Taiping Insurance expanded their investments and businesses in Britain. · Chang’an Auto, SAIC Motor, and Chongqing Machinery and Electric set up R&D facilities in the UK. · Geely Auto spent heavily on R&D of new energy cabs. · Chinese fashion brand Bosideng and NVC Lighting Technology also made proud progresses. Currently there are a total of nearly 500 Chinese companies operating in Britain. These include both state-owned and private ones and all of them are thriving. I want to take this opportunity to warmly congratulate and deeply thank all Chinese enterprises in Britain. I congratulate you for your exceptional achievements. I thank you for your huge contribution to China-UK economic cooperation. As we take pride in our fruitful economic cooperation in the past year, we have every reason to be confident about the prospect of China-UK economic ties. Two days ago, at the invitation of the 48 Group Club, the CBBC, the Great Britain-China Centre and KPMG I gave a speech to their members. The topic was on the Third Plenum of the 18th CPC Central Committee and its outcome document, the Decision on Comprehensively Deepening Reform in China. In that speech, I talked about the 10 opportunities that the Decision has opened for China-UK cooperation. Six of them are directly related to business and trade. The other 4 are also highly relevant. With comprehensively deepening reform and continuous economic transformation and upgrading in China, enterprises have increasingly become China’s principal outbound investors. I believe a golden age lies ahead for Chinese enterprises in Britain. Your capital will snowball. Your business will grow. Your team will expand. · Leaders of our countries have prioritized on stepping up win-win cooperation. · China and EU have started negotiations on an investment agreement and aim to sign a full free trade agreement when conditions are ripe. · Prime Minister Cameron has made clear that Britain will play a positive role in the process. · All these offer a strong support for China-UK economic cooperation. To sum up, I hope that you will seize the opportunities of deepening reform in China and opportunities of growing China-UK relations. I believe that by making full use of these opportunities, you will achieve even greater success. Last but not least, I want to thank the organizer of this event CEAB. 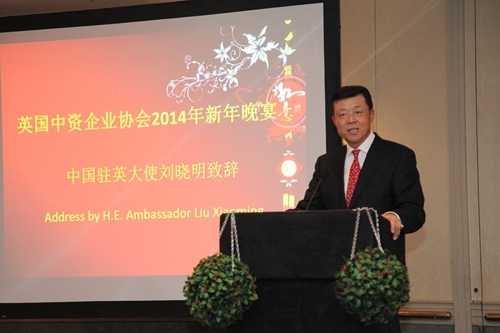 In 2013, CEAB has played an important role in serving, uniting and promoting Chinese enterprises in Britain. It also deserves credit in matchmaking companies of our countries. I hope that in the coming new year CEAB will build on your achievements and become a warm and loving home for Chinese enterprises in Britain. I want to assure CEAB of the continued support from the Chinese Embassy. In conclusion, I wish you all a very happy New Year! And a prosperous year of the Horse!